Conveniences are what we all look for in almost anything that we buy. We buy cars equipped with GPS to help us find our ways and window blinds with motorization options to make life easier. You can find motorized options at American Blinds and Shutters Outlet. Why get up and miss your favorite television show all because of the sun’s glare? You’ll have modern technology at your fingertips as you can control your blinds from the convenience of your couch. Using a remote, you can have them adjusted any way you’d like. Blinds and shades can easily be operated through battery operation. Blinds have a receiver that is located in the headrail to make them operable. Shades operate in the same way. You’ll be able to move them up & down by remote control. If your Orlando windows are in need of something special, give them a boost through our remote-controlled system. Controlling the amount of light can be tough because it changes with every hour of the day. Our popular remote 7 blinds can do the trick. If you have windows that are too far out of reach, then our remote control system will certainly be beneficial to you. You’ll now be able to open and close them with ease. No more getting the step stool out and risking injury just to add a little more light in the room. There are also other options for blinds. You’re not limited when it comes to window treatments for the home. The options and designs are endless because manufacturers want to keep you happy with their products. For affordable window treatment options call American Blinds and Shutters Outlet. We offer remote-controlled brands as well as traditional ones. Depending on the size of your windows you can expect to pay anywhere from$40-$400 per window. 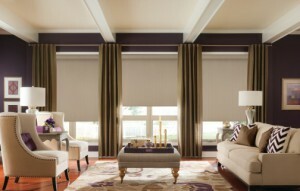 Remote-controlled roller shades also range in price from $40-$100. It all depends on what you’re willing to pay and how many windows you’ll be dressing. Call American Blinds and Shutters Outlet to get the installation process started and start living more expediently. Motorization is taking over window treatments all over the Florida area as the weather continues to get hotter. We want to keep the inside of your home cool and comfortable year round. If you are looking for an Orlando motorization and motorized window treatment expert then please call 407-492-1009 or complete our online request form.